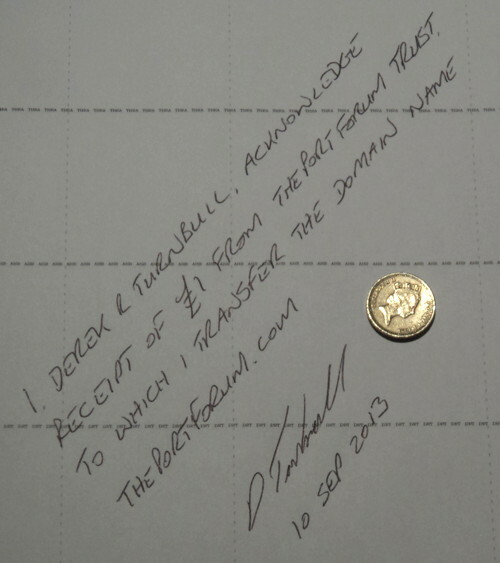 At 6pm on Tuesday 10th September 2013 the domain name ThePortForum.com became the property of ThePortForum Trust. 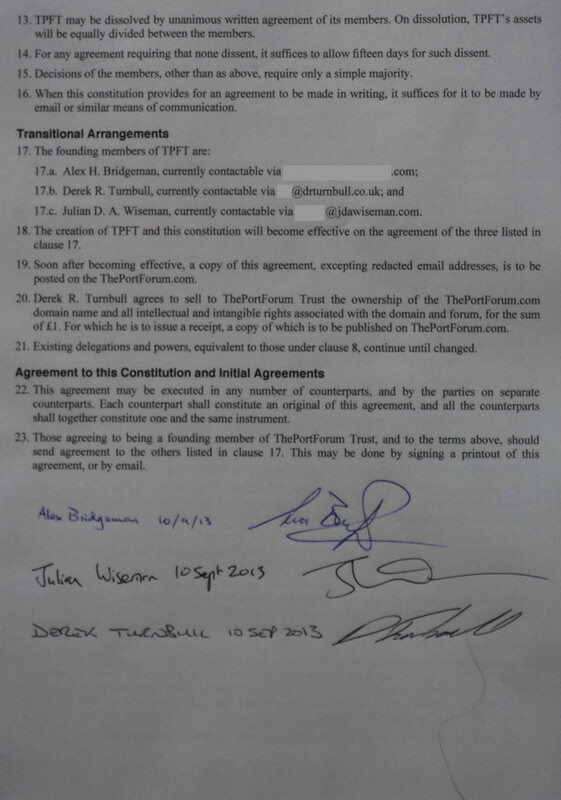 Clause 19 of the constitution of ThePortForum Trust wrote: Soon after becoming effective, a copy of this agreement, excepting redacted email addresses, is to be posted on the ThePortForum.com. In satisfaction of which, see below. 1. ThePortForum Trust (‟TPFT”) is hereby constituted, under the laws of England and Wales, as an unincorporated private members’ association. 2. The aims of TPFT are to own, manage and administrate an Internet forum, ‟ThePortForum”, for the discussion of Port wine, this being served from the URL ‘theportforum.com’, and to own and manage related intellectual property. This forum is to be provided for use by interested parties, in so far as practicable without charge. 3. The property of TPFT shall be vested in the members of TPFT, for so long as any such individual remains a member, who shall hold it on trust for the members of TPFT for the time being in accordance with the rules of this Constitution. 4. From time to time some or all of the property of TPFT might be temporarily in the possession of another. Such property remains that of TPFT. In particular, the domain name might be held by a natural person, who would therefore appear in the WhoIs.net database, seemingly as the owner, even though holding it only on behalf of TPFT. 5. Additional members of TPFT may be elected by the written agreement of the new member and of at least three-quarters of existing members. 6.d. If the other members, without dissent, agree in writing to terminate his or her membership. This is not to be done unreasonably. 7. Members of TPFT have a duty to resign membership of TPFT if they should cease to be active on ThePortForum.com. This is to spare other members having to initiate the process. 8. The members of TPFT may delegate to speciﬁc individuals the responsibility for the routine or technical administration including, but not limited to, registration of the domain, technical ownership of the domain, and hosting, administration and moderation of the forum. 9. TPFT’s costs will be divided equally between the members, except that no member’s lifetime contribution is to exceed £2500. It is expected that these costs will include the likes of registration and hosting of the domain. 10. No member shall enter into any contract or incur any liability on behalf of TPFT without the prior written approval of a simple majority of members. 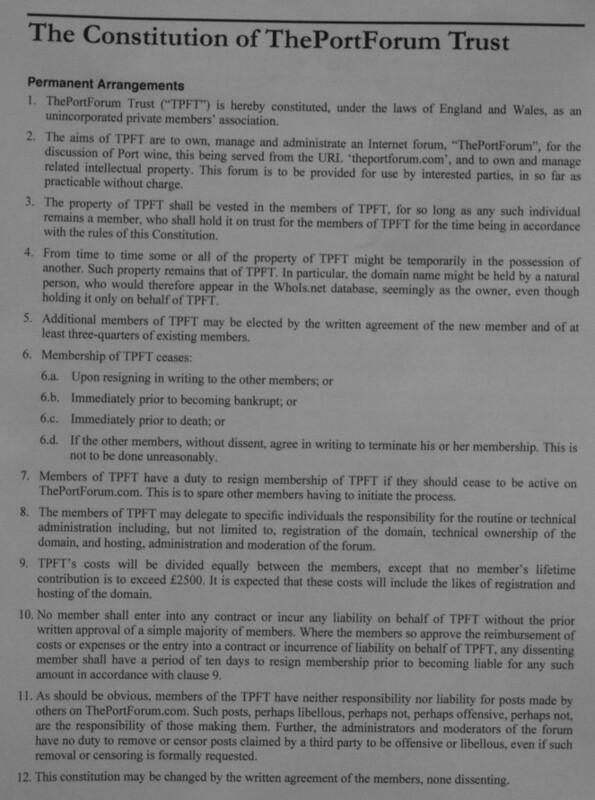 Where the members so approve the reimbursement of costs or expenses or the entry into a contract or incurrence of liability on behalf of TPFT, any dissenting member shall have a period of ten days to resign membership prior to becoming liable for any such amount in accordance with clause 9. 11. As should be obvious, members of the TPFT have neither responsibility nor liability for posts made by others on ThePortForum.com. Such posts, perhaps libellous, perhaps not, perhaps offensive, perhaps not, are the responsibility of those making them. Further, the administrators and moderators of the forum have no duty to remove or censor posts claimed by a third party to be offensive or libellous, even if such removal or censoring is formally requested. 12. This constitution may be changed by the written agreement of the members, none dissenting. 13. TPFT may be dissolved by unanimous written agreement of its members. On dissolution, TPFT’s assets will be equally divided between the members. 14. For any agreement requiring that none dissent, it sufﬁces to allow ﬁfteen days for such dissent. 15. Decisions of the members, other than as above, require only a simple majority. 16. When this constitution provides for an agreement to be made in writing, it sufﬁces for it to be made by email or similar means of communication. 17.c. Julian D. A. Wiseman, currently contactable via [redacted]@jdawiseman.com. 18. The creation of TPFT and this constitution will become effective on the agreement of the three listed in clause 17. 19. Soon after becoming effective, a copy of this agreement, excepting redacted email addresses, is to be posted on the ThePortForum.com. 20. Derek R. Turnbull agrees to sell to ThePortForum Trust the ownership of the ThePortForum.com domain name and all intellectual and intangible rights associated with the domain and forum, for the sum of £1. For which he is to issue a receipt, a copy of which is to be published on ThePortForum.com. 21. Existing delegations and powers, equivalent to those under clause 8, continue until changed. 22. This agreement may be executed in any number of counterparts, and by the parties on separate counterparts. Each counterpart shall constitute an original of this agreement, and all the counterparts shall together constitute one and the same instrument. 23. Those agreeing to being a founding member of ThePortForum Trust, and to the terms above, should send agreement to the others listed in clause 17. This may be done by signing a printout of this agreement, or by email. Clause 20 of the constitution of ThePortForum Trust wrote: Derek R. Turnbull agrees to sell to ThePortForum Trust the ownership of the ThePortForum.com domain name and all intellectual and intangible rights associated with the domain and forum, for the sum of £1. For which he is to issue a receipt, a copy of which is to be published on ThePortForum.com. In satisfaction of which, Derek issued a receipt for the domain, written on an otherwise-unused tasting-note sheet.